After going to a friend's party and seeing his Zojirushi BBCC-X20 Home Bakery Supreme Bread Machine, monkey see, monkey do, I bought one also. The bread maker comes with a recipe book, except the recipes are not very Jewish Orthodox friendly. All of the recipes contain milk. I asked my friend what substitutes he uses and then modified the recipe some more. 17/8 cups of room temperature, not cold, water. 3 tbsp uncooked black buckwheat honey. 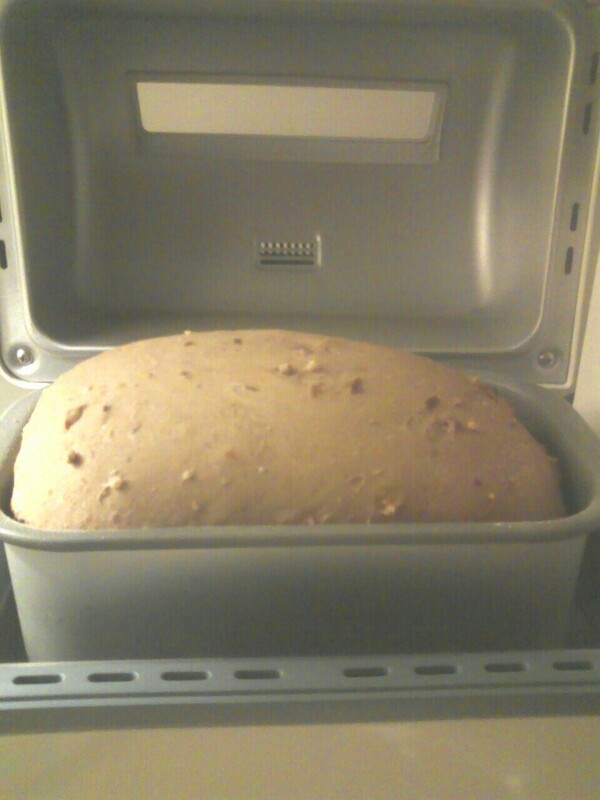 3 cups whole wheat flower. 2 cups high gluten regular flower. 3/4 cup mix of sunflower seeds, chopped walnuts or almond slivers, and caraway seeds. 1 envelope of active dry yeast (3/4 oz). First add water, olive oil and honey. Then flower. Then salt and nuts and seeds. Make a depression in the middle and add yeast. Select whole wheat course and press start. To insure that the majority of the raisins end up inside, I like to add them not when the machine beeps, but rather when it's still doing the initial mixing. Add the raisins when the display says 2:55.